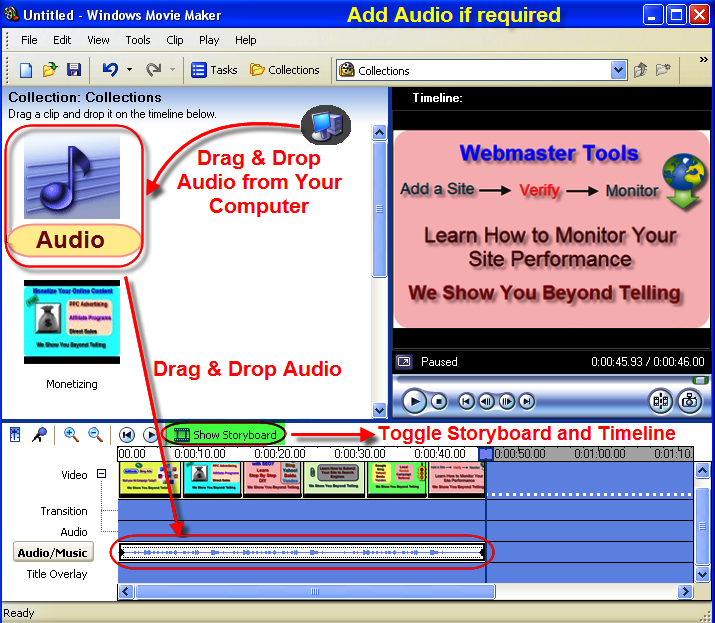 Windows Movie Maker is a free tool available with Microsoft’s Windows operating system. Here is the step by step process of compressing and enhancing your videos using Windows Movie Maker. There are two options available to add your existing video in the movie maker. Go to “Files” menu and select “Import into Collections” to add your video to the movie maker collections or drag and drop your video into the collections area of movie maker. It make take a few minutes to add the video depending on the size, once the video is added just drag and drop it into the timeline as shown in the picture besides. You can see the preview of the added video instantly in the preview pan. Under “Options” menu you can select default video properties like settings the aspect ratio to 4:3 or 16:9. This will change the size of the video in the preview window as well as the final video after saving. Save your modified video under “Files > Save Movie File”. 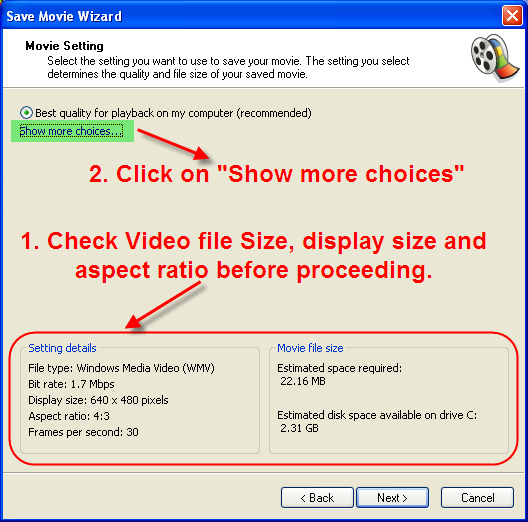 Movie maker will automatically decide the aspect ratio and the recommended option of “Best quality for playback on my computer” during saving your video. “Setting details” section shows the aspect ratio set as per the default settings available in “Tools > Options > Advanced > Video Properties”. You can cancel the saving and go to the menu to change the aspect ration from 4:3 to 16:9. Estimated size of the video can be seen under the section “Movie file size”. Click on the “Show more choices” link to choose the option suitable for your requirement. Choose appropriate video type under “Other settings” option. Movie maker will show you the estimated file size under “Movie file size” section below which helps you to check the amount of compression. Note that the video file size is directly proportional to the quality and display size of your video. Hence choosing better quality than your existing video will increase the size instead of compressing. At the same time if you choose smaller display size like pocket PC option you can see more than 50% reduction in the size. Click next button to start saving the video in the selected format. Play your video with appropriate video player since some of the players will not display the video correctly. If you are reducing the size for uploading into a website, then it is recommended to upload the video into that site and check the quality. If the quality and size are not as per your requirement you can again save the video in different format. Here is the video explaining step by step process of enhancing and compressing your video with Windows Movie Maker. This video is compressed with Movie Maker with the reduction of approximately 25% from 20MB to 15MB in size. Is there somewhere I can find how to do this with the newest version of Movie Maker?